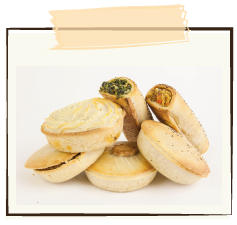 The same pastry case and filling as our meat pie, topped with a decorative swirl of mashed potato. Wheat free, gluten free, dairy free, nut free and yeast free. 1 * 270 g pie per pack. Topping: potato flakes, Nuttelex margarine, salt, pepper.